Ernest Edward Thomas was born at the Tower of London on 16th December 1884, one of the six offspring of Private Henry Thomas of the 44th (Essex) Regiment and Elizabeth (nee Wright). His father transferred to the Durham Light Infantry at the end of 1898, whilst in India, probably at the same time that Edward enlisted into the regiment as a drummer-boy at the age of 14. Henry remained in Burma and India, returning with his family to Aldershot in 1903 and thence retiring in 1905. Edward continued serving with the colours, later transferring to 4th (Royal Irish) Dragoon Guards. When the First World War broke out he was a Corporal with the Guards and was despatched with the British Expeditionary Force to assist Belgium. On 22nd August 1914, whilst on the Mons-Charlois Road, at around 06:30 the unit encountered a German Cavalry patrol and laid an ambush. However, the Germans became wary and were about to flee, when the British Captain ordered a sabre charge on them. Corporal Thomas drew his rifle and fired the first British shot of the war in Europe, hitting a German officer on horseback. A plaque commemorating the first shot of the war by the BEF was unveiled in 1939 at Casteau, ironically only 400 metres distant from a similar plaque commemorating the last shot of the war. 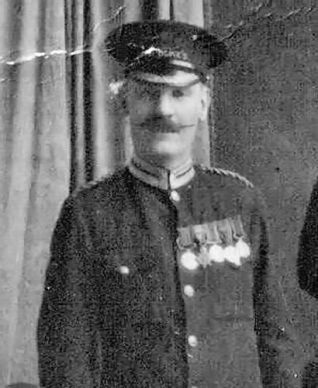 Later during the war Thomas was awarded the Military Medal and promoted to Sergeant, being eventually discharged from Preston Barracks in 1923. After the war he settled with his family above a greengrocer store at 19, Southdown Avenue until around 1937; after which they moved to 68, Stanley Road. With his upright stance and waxed army moustache he became a familiar figure as the Commissionaire of the Duke of York Cinema at Preston Circus. Whilst on duty at the cinema in February 1939, he was suddenly taken ill and subsequently died of pneumonia. Although given a funeral with full military honours in a procession to St. Martin’s church, he was buried in an unmarked grave in Brighton cemetery. My late wife Margaret nee BUSH was Ernest Edward’s Gt Niece. I have information re EET’s parents, etc. I am the youngest grand-daughter of EET. My mother, Violet Ellen Thomas Taylor was his only daughter and she died in 1946 when I was a baby. I have photographs and a personal account of that time and would dearly like to know more. Can you help? Hello Theresa, my mother, now 92, remembers your Grandfather well as her father Sgt. Arthur Vertue was in the 4th Royal Irish Dragoon Guards with him when he fired the first shot. They were friends after the war and while he was commissionaire at The Duke of York Cinema, would allow my mother to go into the morning films as a child, then in the afternoon as an over eighteen year old. Would be nice if his grave could be identified and marked? Hello, would anyone know where his medals are? Possibly still with his family?